“The Banditti of the Forest”, another rare gem by Valancourt Books, available for free! As you surely often hear me lament, one of the big issues with research on the late 18th century is the availabilty of the resources. Sure, you will get all sorts of texts about the primary authors of the era. But what about the second row, so to speak? We all know Coleridge, Byron, and Scott. But what about works and authors from the second or third row? Publishing house Valancourt Books from Kansas City has long fought a quite solitary battle in making those more obscure texts of the Gothic era accessible to modern readers. I have talked about them a few times before, and rest assured, I am not on their payroll. It’s simply that I value their work just so much. Now, last year, they were so friendly as to put an entire old text online for free: It’s The Banditti of the Forest, Or, The Mysterious Dagger, a classic gothic bluebook, of the kind that you would quite possibly never read today – but also of the kind like you would never FIND today. Most readers of Valancourt’s Gothic Classics series know that in the late 1700s and early 1800s, a great many Gothic novels were published, many of which are seeing the light of day for the first time in two centuries in our new editions. However, what many may not know is that a significant quantity of Gothic fiction also appeared not in books, but in magazines. Monthly periodicals like The Lady’s Magazine, The Ladies’ Monthly Museum, La Belle Assemblée, and others mixed Gothic stories among their other articles and content. Although sometimes these were merely short tales or “fragments” that ran for four or five pages in a single issue, the magazines often serialized full-length novels as well. Some of the most popular, like George Moore’s Grasville Abbey, for example, were later collected in book form by publishers. However, the majority of this Gothic magazine fiction has been lost until now and never reprinted. Valancourt is working on a multi-volume set collecting these rare Gothic treasures to be released in late 2013. However, in the meantime, we wanted to share this gem, The Banditti of the Forest; or, The Mysterious Dagger, by an author who signed himself or herself “C.” and which appeared in eight monthly installments in The Ladies’ Monthly Museum from July 1811 through February 1812. Beginning in September 2012, we will post one chapter within the first week of each month so that readers can enjoy this Gothic romance as it was originally published – totally free of charge. I for my part greatly encourage my readers to give the free book a look; this might provide insight in an era and a literary that you won’t bother to delve into, ever, even as a sophisticated (literary) historian. 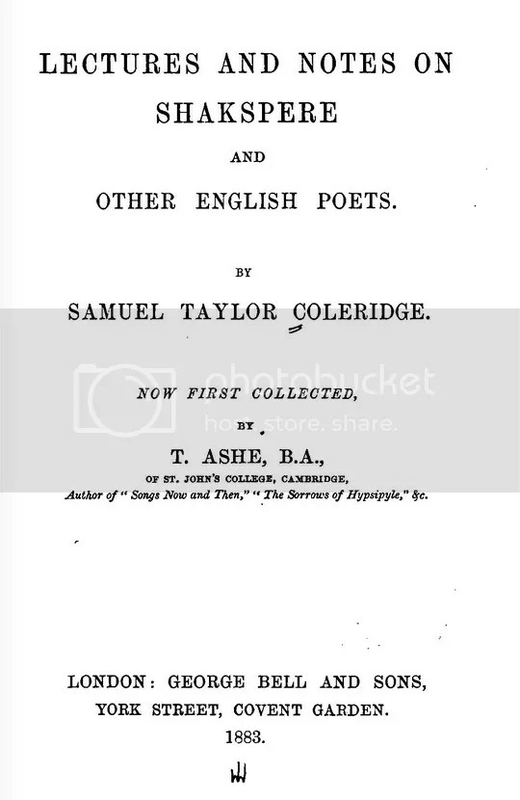 S. T. Coleridge, ‘Lectures and Notes on Shakspere and Other English Poets’ [sic], 1883. You know what day it is today, probably. So, I thought, why not look out for something that comes close to a present, even for a community like the internet, where everything is free, or, hehehe, available for free, if you look hard enough. So, look what I found. I hope it helps everybody’s research. I have looked out for this particular edition for ages. I know it’s probably not a big deal, but I have used flu season to work hard, and I am extremely happy I have access to this book now. The internet archive, truly, a new library of Alexandria! ‘Lectures and Notes on Shakspere and Other English Poets’, 1883.